Rival Gardens is the second in University of Nebraska Press’s Ted Kooser Contemporary Poetry series. In his introduction, the former Poet Laureate observes that Wanek’s poems “offer an indelible language to use while admiring our world.” This succinctly captures three hallmarks of Wanek’s work: deft use of language that sometimes feels inevitable, an attitude of admiration and wonder, and a generous inclusive embrace that breaks down the artificial borders between self and other, domestic and social, and natural and human. It’s all one world. Not only is the personification descriptive of the lamp’s shape, but suggests how it (and by extension, the summer night) has an Edward Hopper sadness to it. Another example of Wanek’s deft imagery reflects a very different tone but uses the same method: “Blue Flags” describes a mountain setting where she saw the flowers, then states: “This iris is the wild blue / I’ve been lost in all my life.” Clearly, this is not about color, but rather a person’s life-search, her longing, and the not-finding. The single word “lost” suggests conflicting experiences. And that is the expansive gift of well-wrought images: they say so much that can’t be said. This poem, in its four quatrains, demonstrates many of the qualities that make Wanek’s poems so rewarding. From her first selection to these new poems, her language is tight with spare, essential word choice and phrasing. In “Duluth, Minnesota,” she describes a moose wandering the downtown as “a big male who left / his antlers somewhere in the woods. / He keeps checking his empty holster . . . ” These three lines evoke feeling for the lost animal, but also ideas about America’s gun culture, ideas which rather than being developed in the poem occur in the reader instead. They occur as suggestions, in part because of Wanek’s gentle humor, which is often accompanied by commentary, as in “Lipstick.” A woman is doing her morning makeup routine, then she “tested a convictionless smile / as the lipstick retracted / like a red eel.” The tone acknowledges how we all know that facing ourselves in the mirror is only occasionally a meeting between friends. Wanek’s ironies are never the sly judgment of bystanders; there’s often some element of complicity. I surprised a wild tomcat in the hayloft. as he looked at me, his expression fixed. The visual detail of “apple buds” suits the descriptive image, but the lightness and brevity of those blossoms embody darker emotions after the line stating the tomcat’s action. Then the photographic dynamic between the child observing and the tomcat not only suspends the moment, as a snapshot does, but it reinforces the cat’s agency—in a sense it is the cat who presses the shutter button, not the girl. These images inform the ideas of the first stanza in rich and complex ways, all with emotional power and moral implications. From this, Wanek observes that “I still think he knew what he was doing, / though not why, / which makes him almost human, // or makes us almost feline.” She neatly blurs the borders, first between species, and then by suggestion between those with power and those without, between hunters and hunted. After describing that she could hear other kittens in the hayloft, she wonders, “How many did he take,” implying that this violation is a process, not an event. Revulsion at the individual ugliness converts into outrage at the deliberateness, the intimation that it could be just the beginning. If this event is prelude, the threat is enlarged. The final line extends the speaker’s consideration as she wonders, “how can I punish him?” The poem embodies a human need for justice but does so by suggesting how vengeance, a natural inclination, reverses the power dynamic: the victimized who take revenge can become victimizers when they desire to see others suffer. Wanek manages to evoke this whole story, suggest all these ideas, and arouse powerful emotions, but her spare language and tone make it seem like she’s barely broken a sweat. It takes remarkable restraint to refine language so it is this transparent. But it is just this kind of transparency that Stanley Kunitz said he seeks in poetry: “I want to write poems that are natural, luminous, deep, spare. 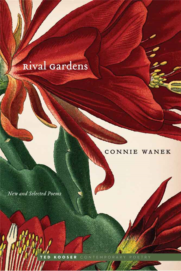 I dream of an art so transparent that you can look through and see the world.” Connie Wanek is achieving just such a luminous vision. This entry was posted in Uncategorized and tagged Spring 2017 on May 15, 2017 by Kelly.